Now that summer is in full swing, so is our family’s wanderlust, right down to the smallest members of the clan. There’s just something about summer and warm weather that makes us want to see the farthest corners of the earth… or even just the lush, green parks around our own city. As long as we get to take a nice drive together and enjoy the great outdoors or some kind of new place or experience at the end of the road, we’re happy! 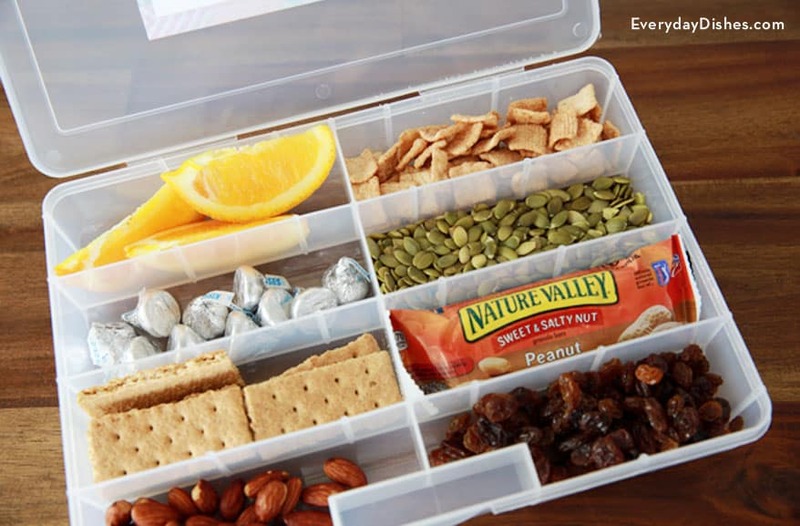 In order to keep the kids happy, however, we know that we also need to pack snacks, so we always have our eyes peeled for new, delicious ideas that are easy to pack up, hand out, and eat on the go. 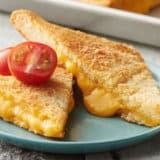 Just in case you could use some simple suggestions for delicious snacks that will travel well and be easy for your kids to enjoy with minimal mess, here are 15 of the best ideas we’ve tried out or come across so far! If you’re going to go out of your way to take a fantastic trip with your family and make sure they’re well fed all throughout, would you also like to make sure that they’re well amused while you’re driving? 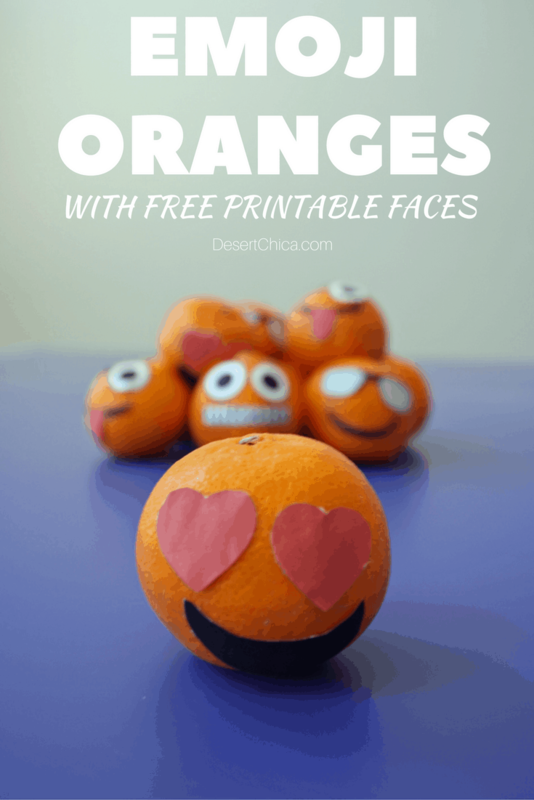 Then we have a feeling you might be very intrigued indeed by this idea from Nifty Mom for making and printing simple games that your kids can actually use their favourite snacks to play! We think it’s smart how they packaged the crackers in a stacking container and gathered their printed game sheets in a road trip book. 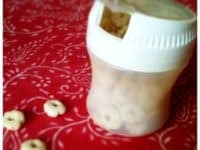 Are your kids the kind of snackers who love a little variety and get bored of snacking on a certain thing quickly after a few bites, but you’re not very fond of the idea of packing several different containers into the car and then having to carry them all around or pass them out to each child and have them share? In that case, we have a feeling you might get a lot of use out of this idea featured on Everyday Dishes! 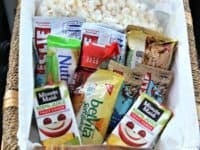 They suggest upcycling a sectioned craft organizer into a travel snack pack that will keep everything your kids like most in one easy to access place. Okay, we know that traditional trail mix doesn’t usually have candy like M&Ms and marshmallows in it, which makes it a little healthier, but sometimes when you’re traveling with little kids, it’s just important to make sure they’ve had a snack and actually enjoyed it so that everyone stays happy. 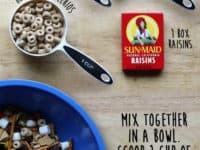 That’s why we love this delicious “toddler trail mix” idea that has a couple extra yummy ingredients thanks to B Superb! 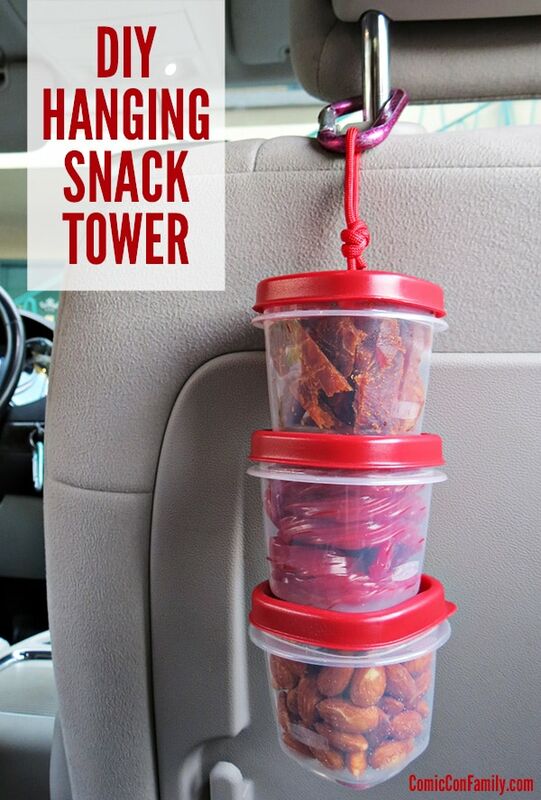 They suggest packing a few miniature ziplock bags that you can easily hand out to hungry backseat passengers. 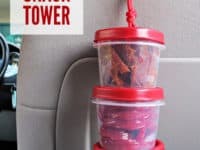 If you’re going to make your kids some road trip snacks to take on your next trip, would you rather actually stay away from store bought things because you prefer making them healthy, slightly more nutritional things instead? 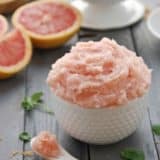 Then we’d be willing to bet that you, like us, enjoy saving and stocking up homemade recipes that are quick and simple but hit that perfect balance between being “healthy enough” and still being “a treat”. 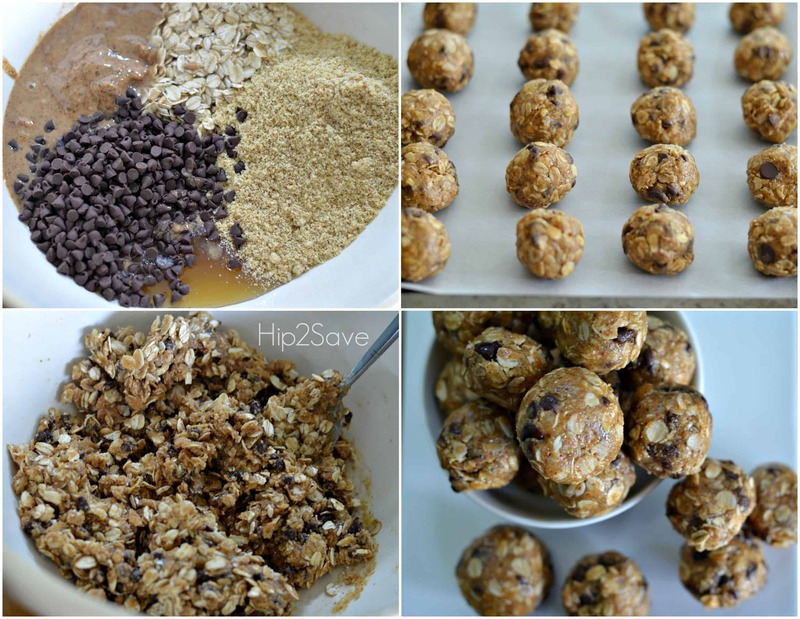 These no-bake oatmeal energy bites outlined by Hip 2 Save are the perfect example of what we mean (and we can confirm, having actually tried them ourselves, that they are totally delicious). 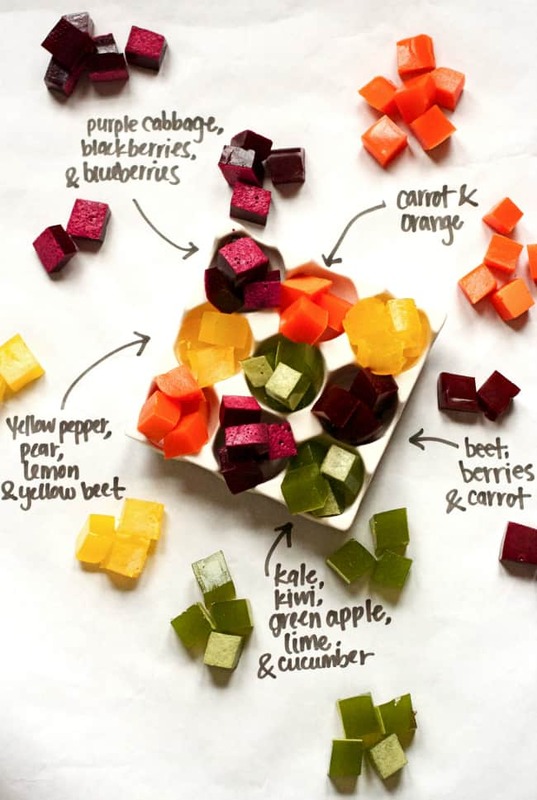 Are you actually in a bit of a hurry and you’d much prefer to just grab some fruit because you know your kids love it and will absolutely be willing to eat it, but you’re still intent on making the whole “car snacks” thing a little more fun than usual? Then maybe you’d prefer to try something funny like this emoji idea featured on Desert Chica instead! 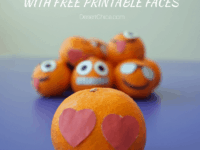 Their tutorial shows you quite simply how to cut out cartoon facial shapes and take them on so each child gets a different emotion when they need a snack. 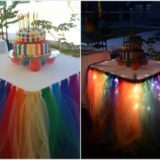 Do you usually find that your kids enjoy things like crafts and snacks best when they actually get to be a part of the process? 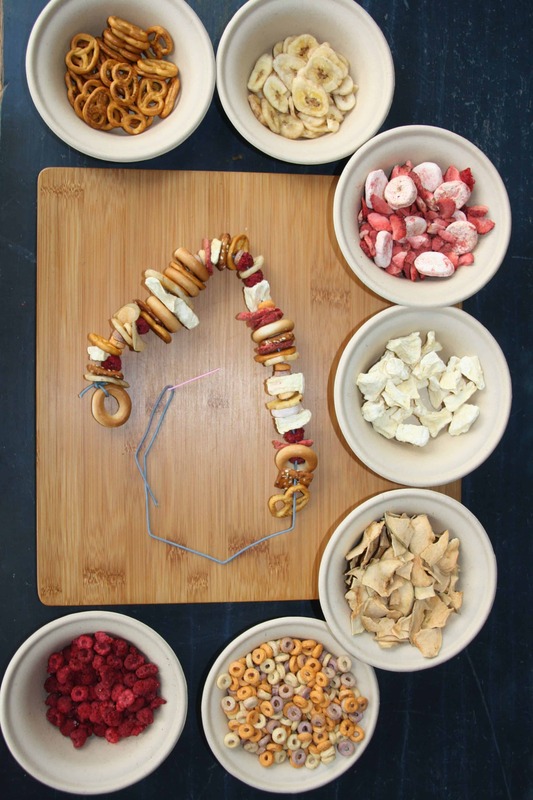 In that case, we have a feeling that this snack necklace idea from Copy Kids will probably be a pretty big hit in your house! 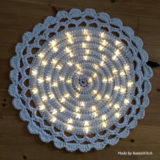 They suggest filling bowls with different yummy ingredients that either already have holes in the middle or can easily be poked through using a safe darning needle in order to string them into a necklace. 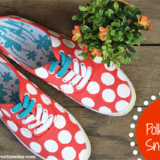 Your kids can wear them while they run around your next awesome road trip destination and snacks as they please throughout! 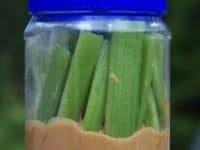 In our house, peanut butter and celery is one of the absolute most popular snacks among the kids’ ranks, which we consider quite lucky given that it’s actually a healthy option indeed compared to what a lot of kids like to eat best. 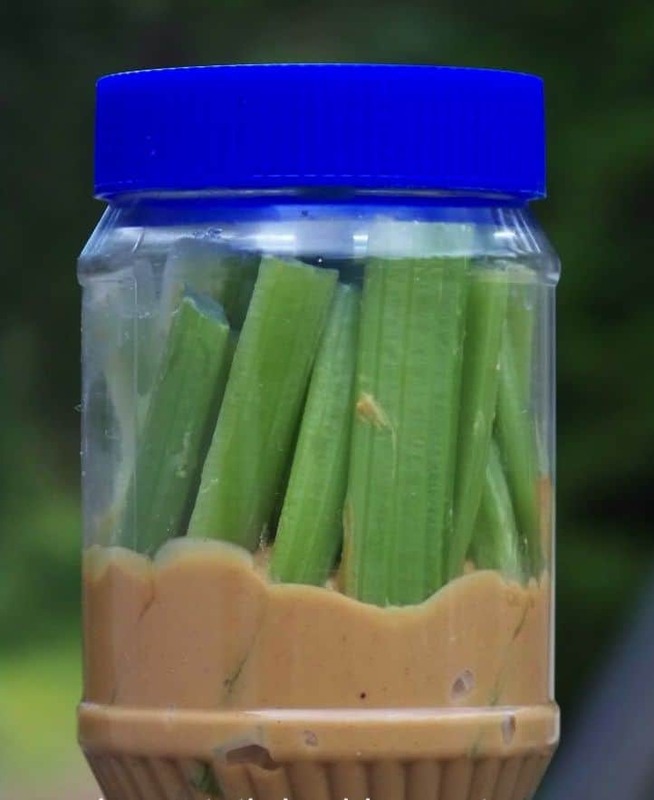 Snacks that involve dips aren’t usually the easiest things to travel with, however, so we were very grateful to come across this creative upcycling idea from Cool Mom Picks that makes celery and peanut butter a snack to go! They suggest saving the last couple inches of peanut butter in the bottom of the top and then just sticking your celery sticks right in there and screwing the lid back on. 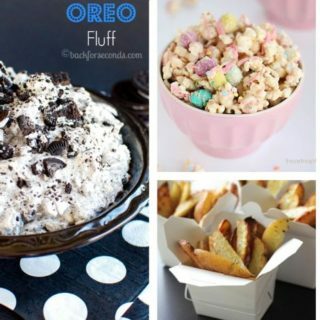 It keeps everything contained and it’s perfect for dipping! Fruit salad is a delicious and healthy snack for literally any warm day but serving it isn’t always the most convenient thing. 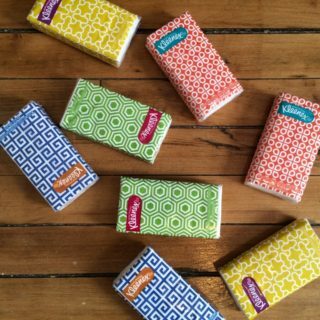 We’re perfectly open to the idea of taking things in small washable tubs but we find that our kids are apt to lose cutlery, so we hesitate when it comes to taking our actual silverware on long trips and in packed snacks or lunches. 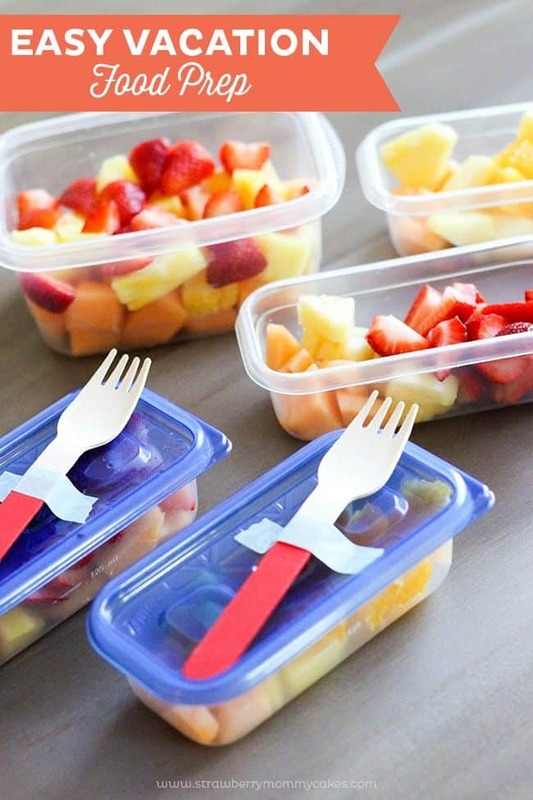 That’s why we liked this simple portable utensil idea from Printable Crush! 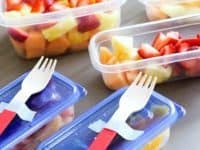 They suggest taping a plastic fork to the lid of each tub of fruit salad so you know you’ve brought enough, everyone gets one without any of them getting lost, and you don’t have to scramble in the car trying to divvy up the forks while everyone waits excitedly for their salad. 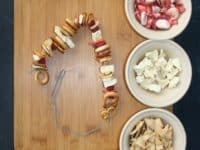 Perhaps your kids are still little enough to want a variety of snacks that are easily accessible to them but they’re also old enough to help themselves so long as the snacks are within reach? 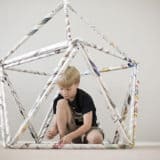 Then we’d absolutely suggest taking a look at how Comic Con Family created their own DIY stacking tubs and string them onto the back of the front seats so they hang right there for the kids to munch on whenever they please! 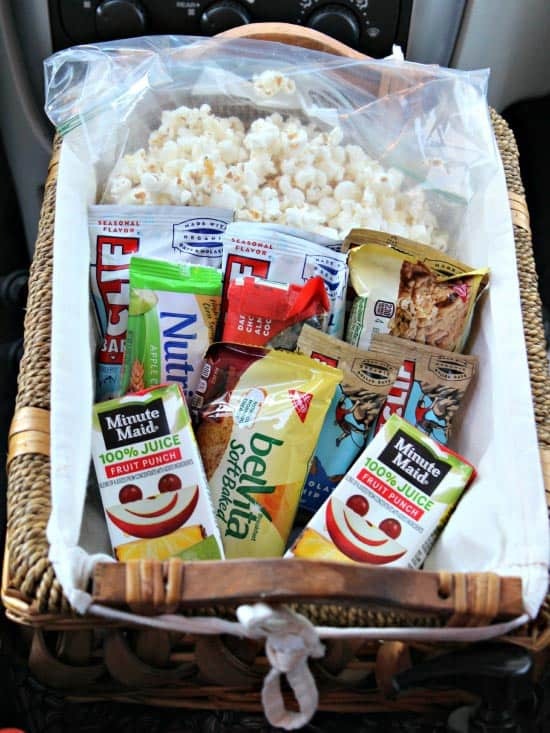 If you’re going to have a “free for all” style road trip snack option where your kids can reach for something to eat whenever they please would you rather make it a whole station that’s just chalk full of things? 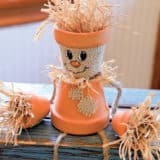 In that case, we have a feeling you might be the perfect family for something like this console basket idea featured on KC Edventures! They show you how to secure the basket between the two front seats so it doesn’t shift around and everything stays safe and they also make suggestions for simple snacks to put inside as well. Were you very intrigued by the idea of having some homemade healthy snack options that travel well but your kids don’t like oatmeal based things, so the previous idea that we showed you just won’t work right for your family? 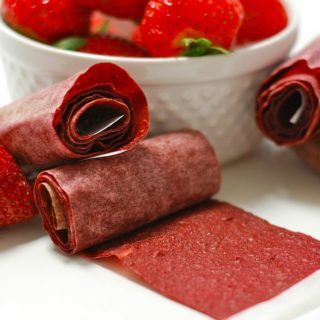 Then here’s a fantastic alternative for you that’s a little fruitier! 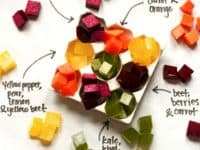 Modern Parent, Messy Kids guides you through the process of making delicious homemade fruit gummies that are a little healthier and more interestingly flavoured than what you’d find in stores. When it comes to making road trips as easy as humanly possible, it’s not always actually the snacks themselves that need “solving”, per se. 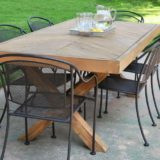 Sometimes the kids just really need a place to put them while they eat that’s a little steadier than their laps! 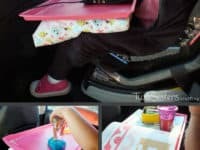 That’s why we thought this DIY road trip tray idea featured on Two Sisters Crafting was such a fantastic idea. 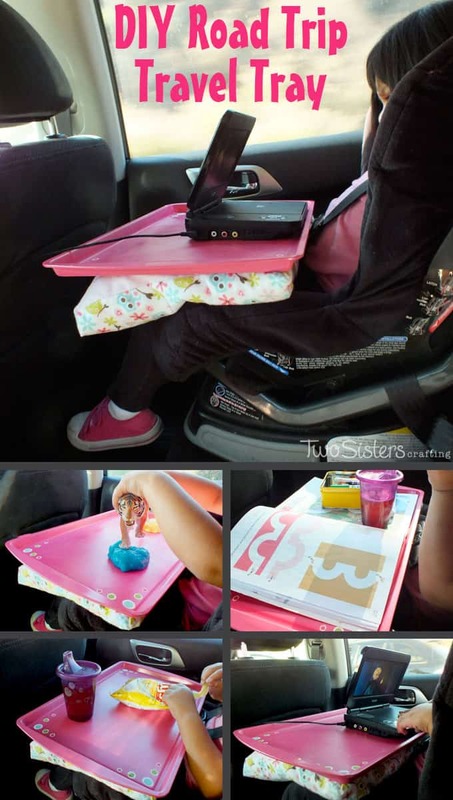 They guide you step by step through the process of making a lap cushion and transforming a baking sheet into a comfortable, super useful driving table that kids can eat snacks or do activities on in the back seat. In our house, one of the other super popular snacks is granola bars that have a yogurt coated side. 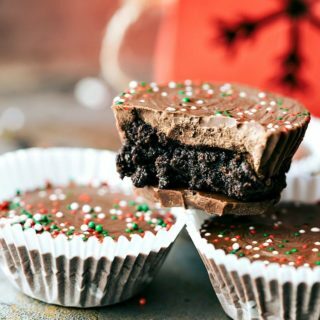 Between the crunch and the sweetness of the yogurt layer, they’re just so delicious that our kids can’t get enough! 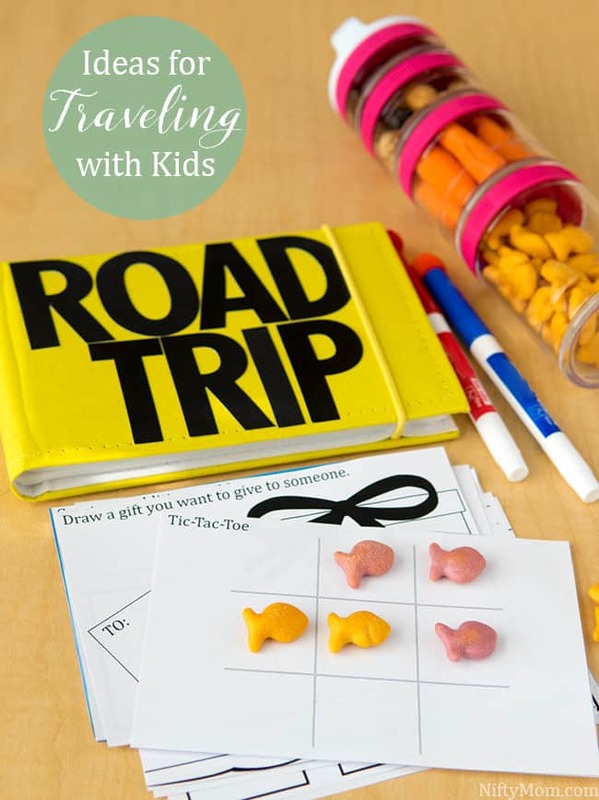 In fact, they actually eat so many that buying them has been getting expensive but they’re still the perfect road trip (and school, and purse, and general purpose) snack, so we don’t want to give them up entirely. That’s why we were so thankful to Tasty for teaching us how to make them ourselves! 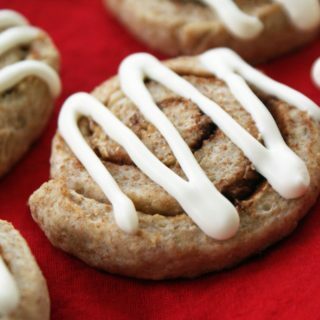 Get the full recipe and ingredients list on their website. 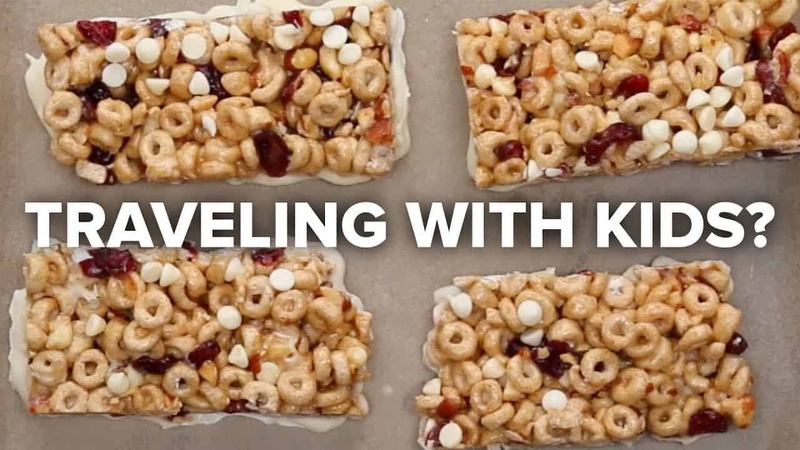 Were you intrigued by the cereal element of the homemade granola bars we showed you above but your kids are still very young and you think you might be better off sticking to finger foods and smaller snacks that they can munch on throughout the drive? 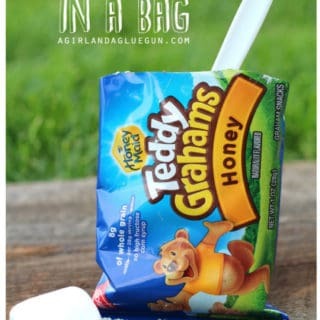 Then here’s a very simple snack idea that’s also a great upcycling project! 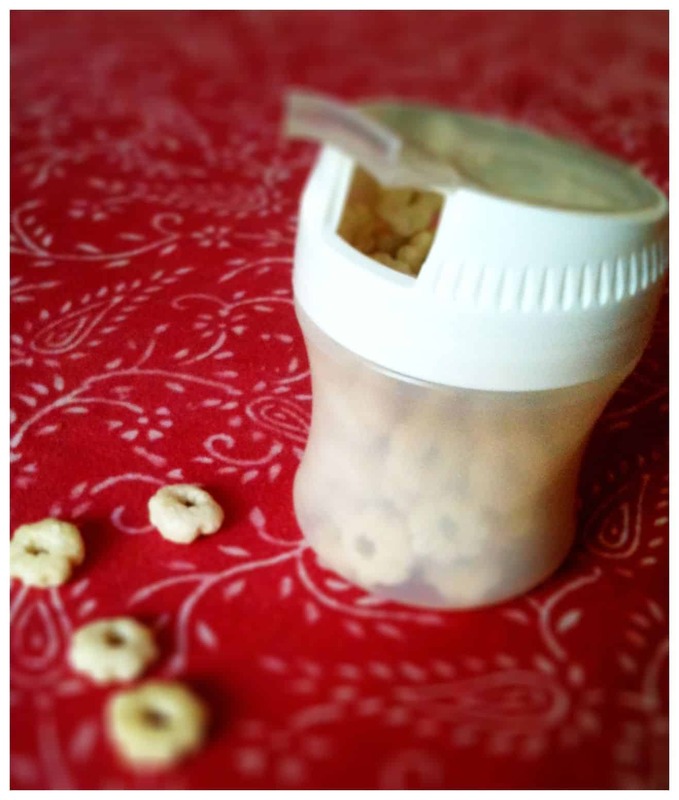 Pinterest suggests using an empty bulk chewing hum container with a clicking lid as a travel case for cereal snacks. 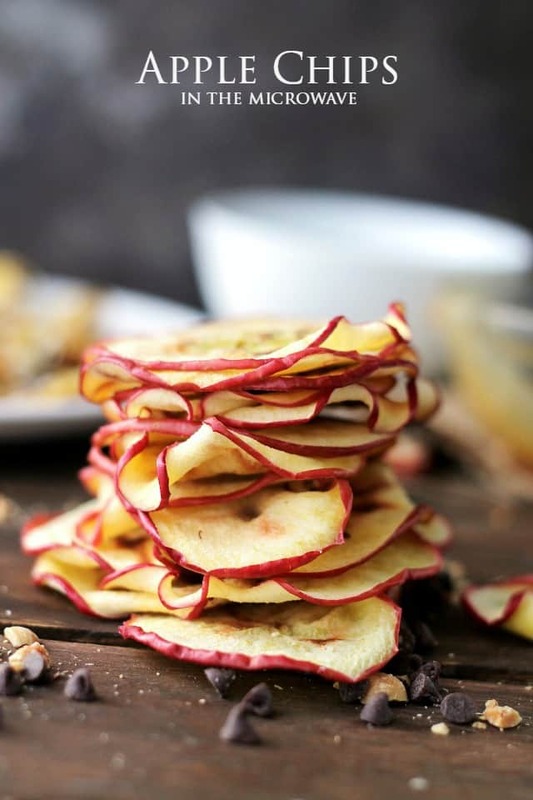 Just for the sake of having lots of great options in your snack arsenal, here’s another deliciously health idea outlined on Diethood! 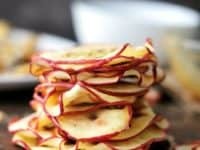 They show you how to make apple chips that are full of nutrients, give your kids a satisfying crunch similar to potato chips, and taste great whether you make them sweet, salty, or somewhere in between! 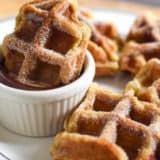 The best part is that you can actually make them in the microwave, so they’re pretty quick and simple for how great they taste.